Modern Upholstery Fabric :: Retro Upholstery Fabric :: Momentum "Knack Filament" - 11 7/8 Yards - Free Shipping! Momentum "Knack Filament" Upholstery Fabric - 11 7/8 Yards - Free Shipping! This listing is for 11 7/8 yards of "Knack" modern fabric in the "Filament" colorway from Momentum Textiles. 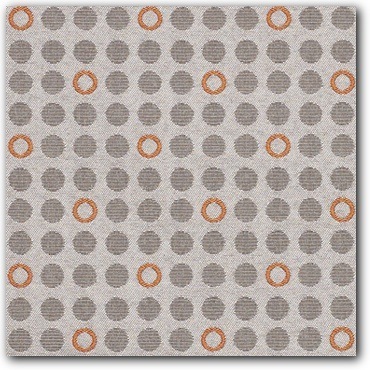 Nice, inexpensive commercial fabric that has a small repeat design with Gray/Silver and Orange in the design. Very durable, medium-weight fabric that will resist wear for a long time. You could pay $25.50 per yard (a $302.81 retail value!) at www.themomgroup.com, but why??? More Cool for you at less cost!